A while back JP and I had planned to go for a ride today but to leave the Harleys at home. A simple SS1600 route was planned through familiar territory… then FarChallenge happened and our smart plan went out the window. Today was going to be tough anyway, why not just make it tougher by adding some stops and playing it by ear? Our FarWeapons of choice for the day.. JP on this, the wonderful LAMS legal KLR-650 w/GPS, airhawk and a SPOT that rarely works. Yamaha TTR-250. She was going to have her first IBA run, actually her longest run since I rode her home from Cessnock. We tossed out the idea of carrrying spare fuel and would work the range/stops out along the way. Just ride ride them the way they are and see what happens. With the witness forms done at home, we left for our usual start at Lambton for a fuel docket of 3.52am and off we went towards Scone, sort of confident I wouldn’t run out of fuel before then. 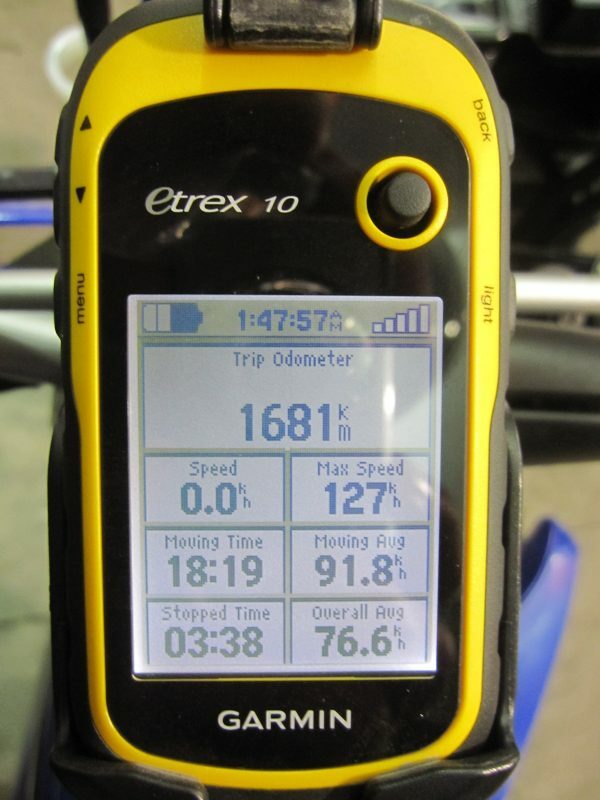 JP was in the lead using the GPS for speed, the TTR’s speedo is all over the place and it was too dark to see the etrex. A few k’s before Scone the primary tank on the TTR ran dry and I realised I had forgotten to memorise where “res” was. JP didn’t immediately notice I’d stopped and rode off with the torch, so I was left on the side of the road looking for “res” with my phone for light. That sorted, first fuel at Scone. The range of the bike set at 140 before reserve although later I got caught out at 120ks. 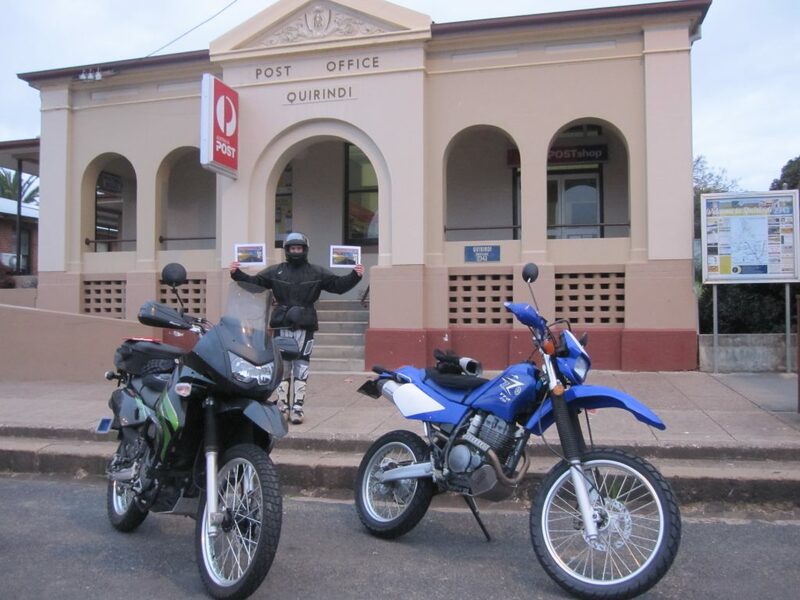 Then we headed for our first FarChallenge location, Quirindi, arriving not too long after daybreak. I remember thinking that were pretty lucky with the weather, it was cold but manageable. That wasn’t to last. 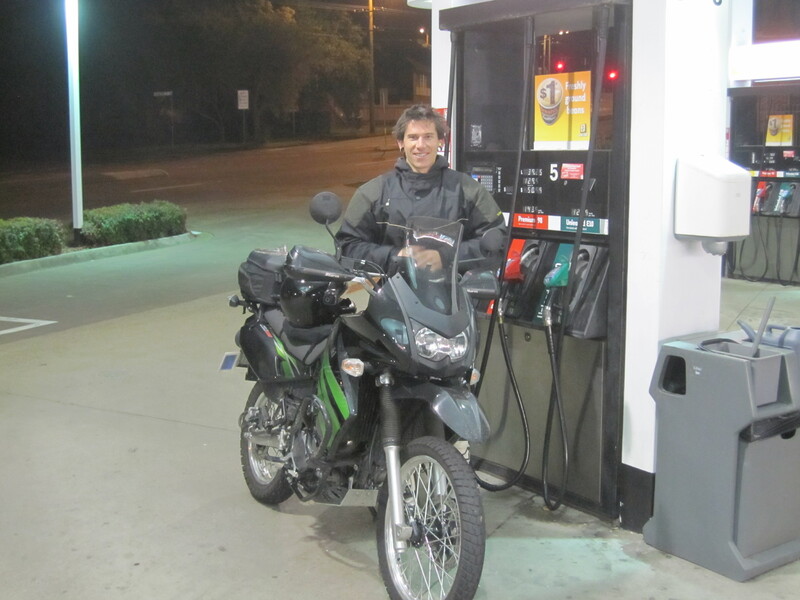 Next fuel was Tamworth and we left there riding on wet roads towards some very heavy cloud. 2nd FarChallenge pic at Moonbi. JP didn’t have an trouble finding Moonbi. 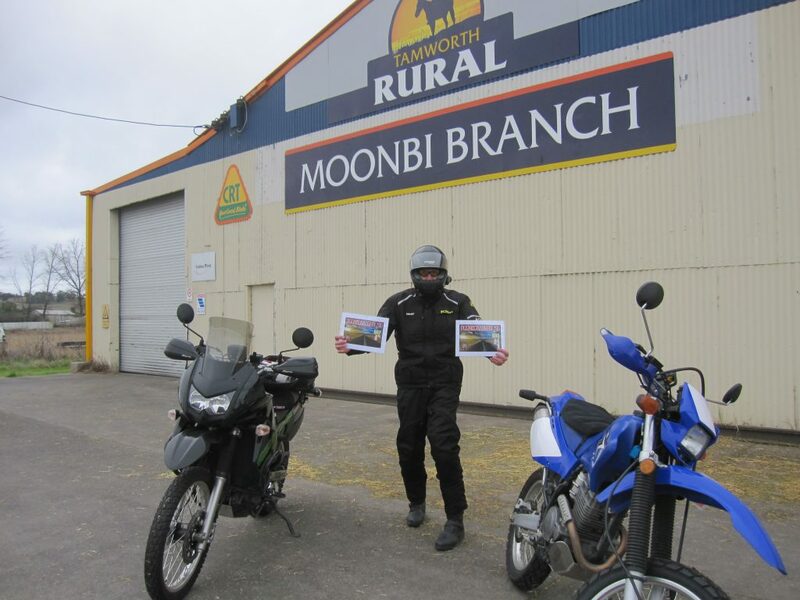 Next fuel was Glen Innes, we’d seen some breaks in the clouds but it was still very cold. Some quick Sultanas and the missus’ Banana Cake and we were out of there. JP, despite having the GPS missed the left turn to Emmaville but for some unknown reason the GPS connected to my headset for the first time in the trip and it was telling me to do a u-turn while JP rode on ignoring the screen. I stopped him, had a laugh and we turned and were soon on our way to Emmaville for out next FarChallenge pic. A great piece of road that one, but I’m not sure they get too many visitors at Emmaville. We walked into the shop to grab a corner docket and got a very strange reception. There’s roadwork on the stretch between Emmaville and Deepwater so I got to try out some speedy gravel work with the TTR, it was fun. Back to the New England Highway for a left turn towards Tenterfield for the next fuel stop. 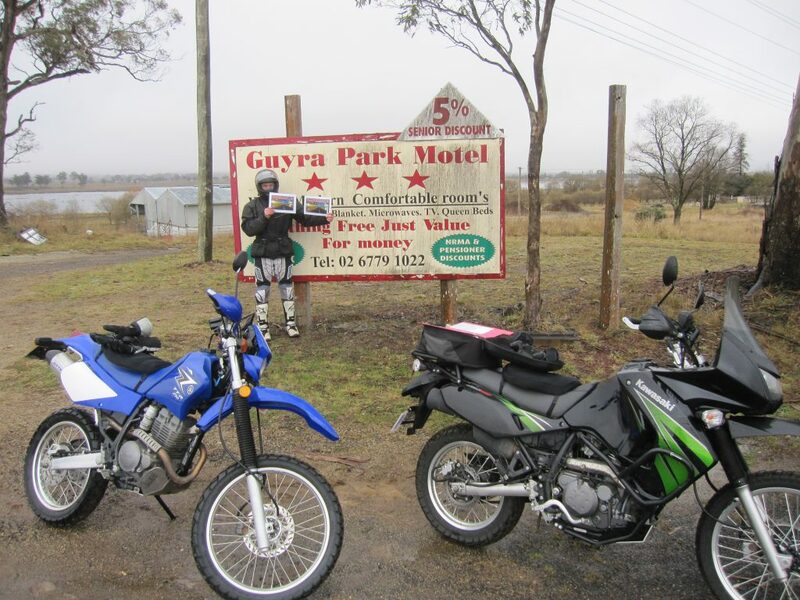 Tenterfield was packed with motorcycles of the Adventure kind, KTM 990’s BMW GS and GSA all loaded to the gills. JP and I got some strange looks as we fuelled up and rode through. 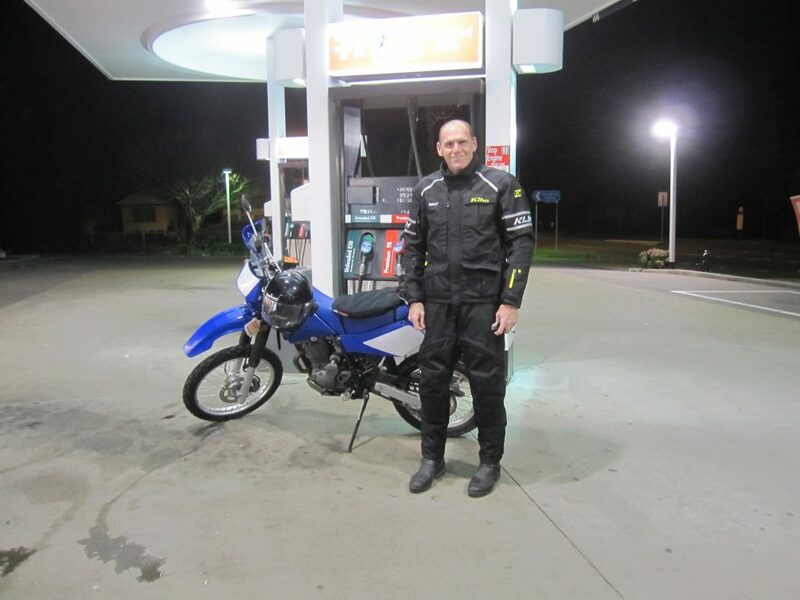 At the servo a guy on a Multistrada pulled in behind me and gave a smirk, I couldn’t help thinking it wasn’t yet midday and we’d already done over 600k’s with over a thousand to go, I was wondering if he was up to the challenge. Having said that, my 6’5″ frame packed on the TTR would be smirkworthy at best! We left Tenterfield for Casino. I hadn’t ridden that road before, what a pearler! The day was warming up, it was scenic and bend after bend came at us. I became more confident on the TTR and discovered that you could gather some momentum and carry speed through corners if you worked really hard. I made it to Casino on fumes and we filled up again. Next stop Nimbin for a FarChallenge Pic. Nimbin was packed, so we found a park outside the Catholic Church. 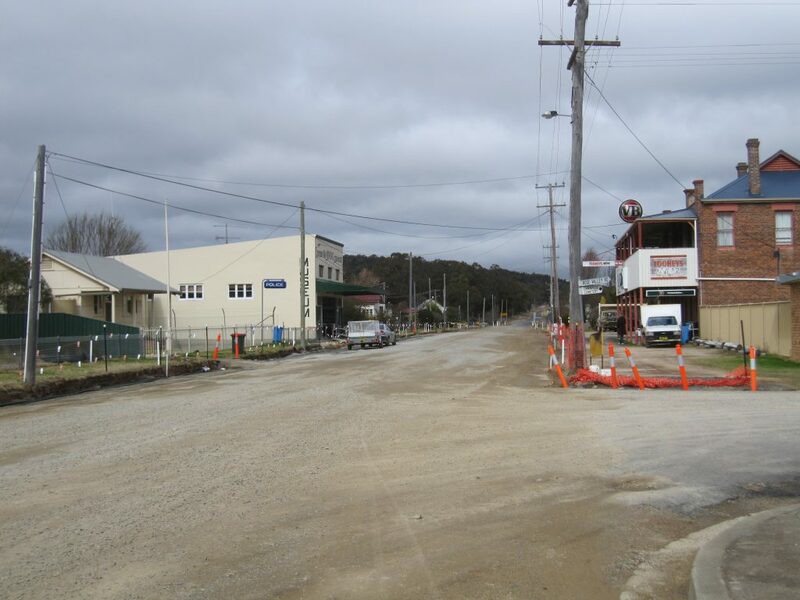 One thing we did note was that with the road into Nimbin being 80kpk and the road out towards Murwillumbah being the same, in a bad state and full of traffic we had really started to eat through the time. 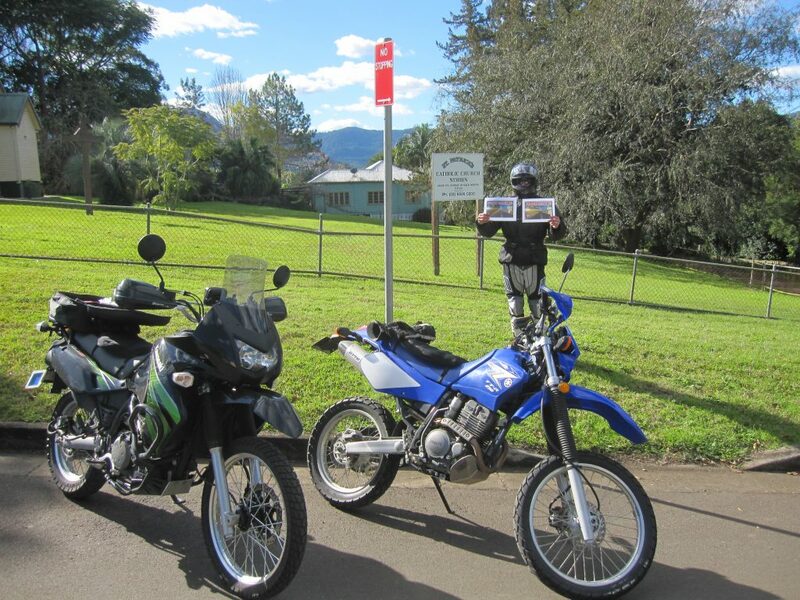 Our loose plan was to head further north and grab a pic at Tamborine but I was getting concerned about time. 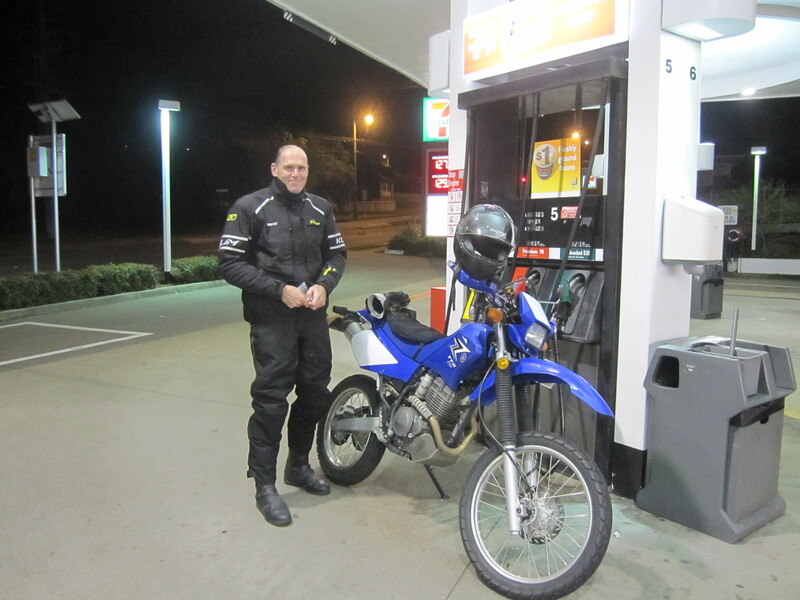 I heard the GPS tell us to take a left before Murwillumbah to head north, JP kept going and by the time we got a chance to have a chat we were in Murwillumbah with about 800k’s done. We decided that the SS1600k was the priority for the day, we’d chewed up half of it already and we were short of another 800ks to get home from there down the Pacific Hwy (which poses it’s own challenges for keeping averages up). So a quick plan was devised, freeway up to Tweed Heads for some faster k’s, fuel and a docket and straight back down the Pacific Hwy to Beresfield. This was still short but gave us the opportunity to keep the whole ride within 24 hours and pull out close to home if Rule 1 dictated. So a touch after 3.30pm we were at Tweed Heads and then it was heads down, butts high trying to keep our momentum going so that hopefully we could get just one meal stop for the day. Fuel at Woodburn, Grafton, Macksville and no mucking around got us to Port Macquarie with time to settle in for 20 minutes for some McChickens and our first coffee’s since breakfast. 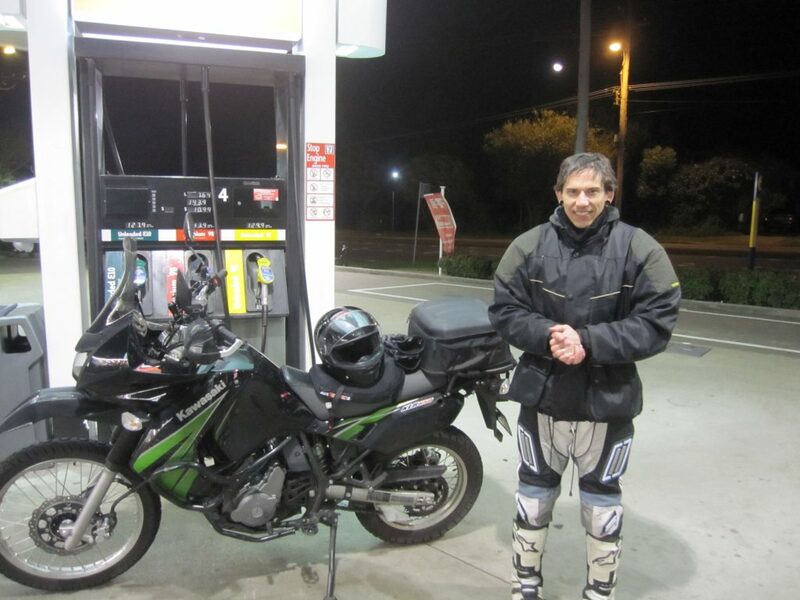 The cold had returned so we also took time to thaw and reset ourselves for the penultimate leg to Beresfield where we were going to make the call to either call it a day short on k’s or flash down the F3 to the twin servos near Wyong and back to Lambton to complete the run. Both of us were still going very well by the time we hit Bero, we had the time and plenty of energy to finish the SS1600k, so we did. Back at Lambton at 1.41am, just shy of a 22 hour day. 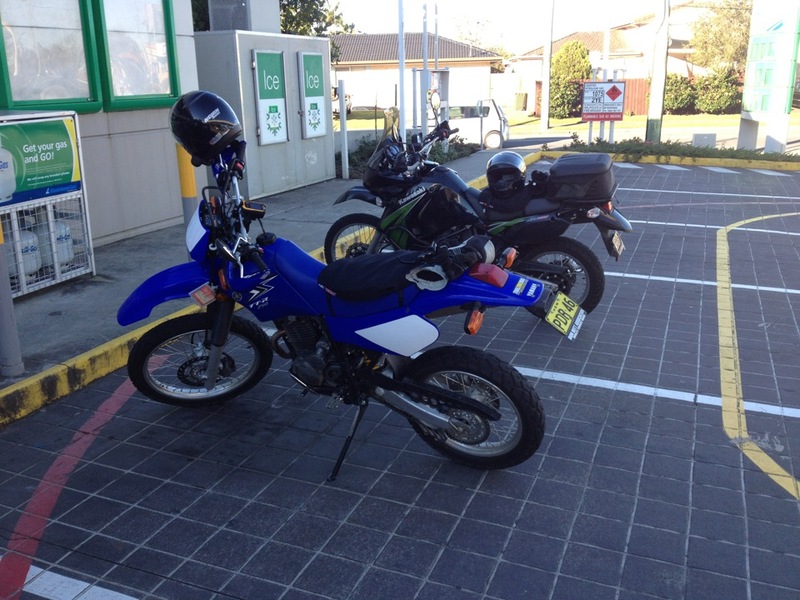 14 or so fuel stops, five photo opportunities, one meal break 1681ks, on little bikes. What more could you ask for? Etrex says it all although one number couldn’t be right! And me, with no hair to speak of. Would we do it again? Sure! Next time though JP wants to ride the TTR and I don’t have a problem with that! We already have a route in mind. Today was definitely FarChallenging.